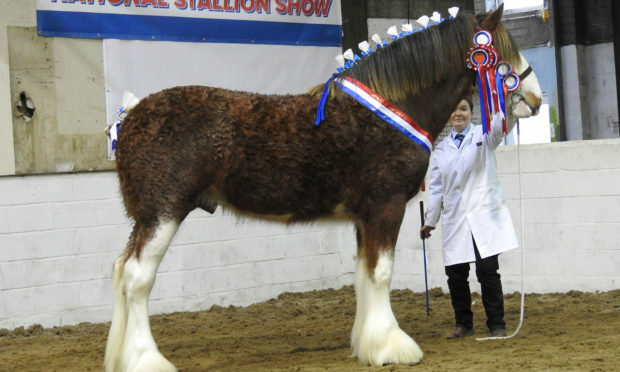 Supreme champion Clydesdale Doura Magic Touch from Charlotte Young of Hall, Ayr. Put forward by Charlotte Young, of Ayr, Doura Magic Touch is no stranger to the limelight having claimed the Cawdor Cup at last year’s show, as well as senior and reserve overall champion at the Winter Fair back in November. The Irish-bred colt is by Glebeview Sir Charles and out of the Carnaff Ambassador-sire mare, Ballinrees Lady Jayne. Judging the males at the event, which was held at Morris Equestrian Centre, Fenwick, was John Drummond of Bangor, Northern Ireland. The female championship and reserve supreme went to Amanda Stewart’s mare, Mollinhillhead Donna’s Dream, from Mollinhillhead, Mollinsburn. This home-bred six-year-old is by the Stewarts’ own stallion, Mollinhillhead Celebrity, and out of Millichen Pamela, a Caldwell Winalot daughter. The prestigious Cawdor Cup was awarded to Collessie Connoisseur, a home-bred yearling colt from Ronnie Black of Collessie, Cupar. By Redcastle Brelee Majestic and out of the Collessie Redcastle Hallmark daughter, Old Greenlaw Jura, he had an outstanding run of success during the foal show season, standing reserve foal at Grampian and Forfar. The Bedford family of York were victorious in the Clydesdale gelding championship with the two-year-old Deighton Donald. By Thorpe Hill Challenger, he is out of the grade-up mare Deighton Maria. Across in the Highland Pony ring, the championship went to John and Kate Dykes’ Marksman of Mendick, from West Linton. This home-bred three-year-old colt is by Strathmore Airlie and out of Gissings Luscardene. Shirley Clarke of Lockerbie took the reserve Highland title with Bethoc of Conway, a six-year-old mare by Stirlingdene, out of Iona of Conway. The Transy Stud, based near Dollar, took the Shetland championship with Rosscalin of Transy. He is a home-bred standard two-year-old colt by Elderberry of Transy and out of Roseljord of Transy.The reserve overall Shetland honours went to the miniature winner, Ardnabeag Fairy’s Firelilly, from Gillian McIntosh, Galston, East Ayrshire. Bred by Gillian herself, this nine-year-old coloured mare is by Fairy Flavian and out of Chewvalley Rosebud. Reserve standard was Midcalder Midnight from Amy McConville, Over Baldinnie, Ceres. By Millhouse Director and out of Kerloch Vera, this three-year-old mare was reserve junior at West Fife.